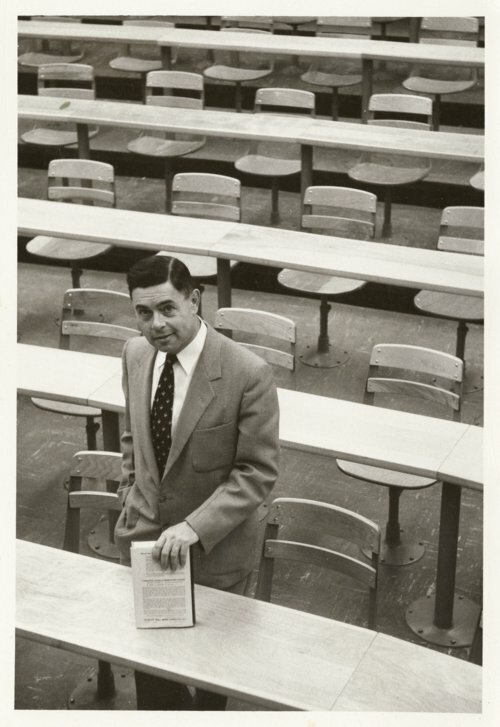 This is a photograph of Robert S. Raymond taken while he was teaching at Ohio University. He grew up in Kansas City, Missouri, where his family owned a furniture store. After graduating from high school, he attended Kansas City Junior College for two years and later graduated from the University of Kansas in 1934. Following his graduation, he worked in the family furniture store. In the spring of 1940, he joined the American Volunteer Ambulance Corps and went to France. He drove ambulances into unoccupied France, Spain, and Portugal. Raymond joined the Royal Air Force and became a bomber pilot. Later, he was transferred to the United States Army Air Force in England and shipped back the U. S. where he learned to fly B-17s and B-24s. He was sent to several bases where he taught students to fly B-17s and B-24s. After the war, he returned by Kansas City, Missouri, and worked in the family furniture store. Later, Raymond attended the London School of Economics, received a master's degree from Kansas University and a doctorate from Ohio State University. He taught at several universities including Ohio University, Northeast Missouri State University, Harvard School of Business, Wichita State University, and Washburn University. This photograph appears in Twenty-Five Years The Road Taken by Robert S. Raymond and Elizabeth Raymond.